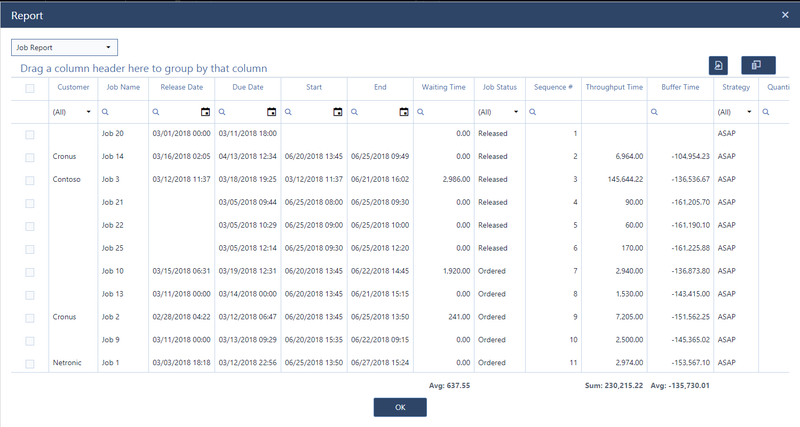 In this dialog you can create reports of tasks, jobs, capacities, resources, templates, and the shopfloor and export them to Microsoft Excel for further analyzing or printing them. The reports can be customized by way of grouping, filtering certain fields, and adding/removing columns. Choose the type of report you want to create. 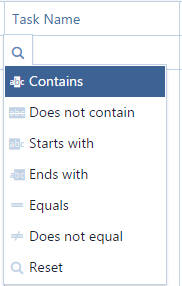 Click in the column header of the field you want to group your report by and drag it to the according line. Filter any field by entering the criteria in the search field next to the magnifyer icon or point to the magnifyer icon without clicking to select from a list with relational operators that differ depending on the field data type. Export the report to Microsoft Excel and store the data there or use Excel for analyzing and tweaking the data further. Select the fields you want to see in your report by dragging them to or from your report. Clicking the icon will open a small window. 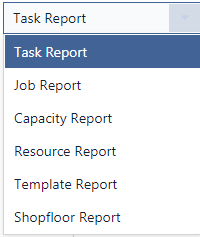 If this window is empty, all fields are already displayed in the report.